Enchanted Fairies are thoughtfully assembled by hand, using a variety of textured fabrics, meshes, jewels, glitters and accents customized to fit the vogue & lore of each ornamental doll. 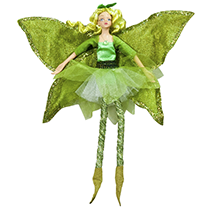 Our Fairies have bendable legs and an attached acrylic loop allowing for both seated and hanging positioning. Green Leaf fairy with green hair, assembled by hand with colorful cut fabrics, felt, glitter, and small jewels. All fairies have bendable legs & wings. Blossom fairy with golden blonde hair, assembled by hand with colorful cut fabrics, glitter, small jewels, and a miniature pink flower. All fairies have bendable legs & wings.